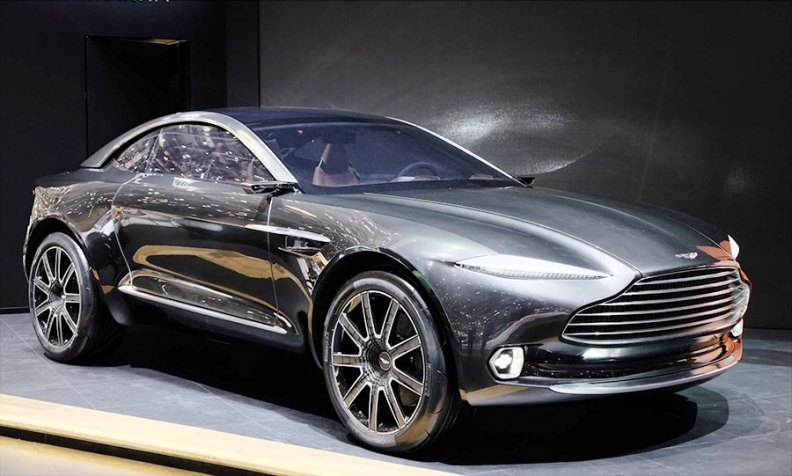 Aston Martin unveiled a DBX concept at the Geneva auto show in March. LONDON -- Aston Martin is reviewing more than 10 sites in Europe, the U.S. and other global locations for a new factory to build its first crossover. Aston Martin needs a new plant for its DBX crossover because its only factory in Gaydon, central England, has no room for expansion. Last week, British Prime Minister David Cameron told BBC News that he would “make available” a former air force hanger in Wales for production of the crossover. Aston Martin CEO Andy Palmer has previously said that the company is considering locations in the UK and U.S. for the plant with Alabama an “obvious choice” because the automaker's industrial partner, Daimler, builds Mercedes-Benz SUVs in Vance, Ala.
Daimler has a 5 percent stake in Aston Martin and the German company will be supplying engines and electronics such as infotainment systems to Aston’s next generation of cars. Aston Martin is targeting sales of about 3,000 a year for the DBX as part of a plan to more than triple annual sales to 15,000 from around 4,000 last year to allow the company to be consistently profitable. Aston Martin’s board will consider options for the plant in October, the Financial Times reported last week.